How smart is this touch-capable computer? If you need a modest laptop and you're concerned about its looks more than the fine details, you'll be happy with this. Budget laptops aren't supposed to look good, but HP's latest model bucks this trend: it's got a stylish dotted pattern, plenty of clean curves and a simple, dark interior that'll turn heads. The best part? It's only £400 (about US$664, AU$717). That money usually means cheap and nasty, but that's not the case here. The TouchSmart's lid is silver-coloured and is covered with little white dots that aren't too intrusive but make this machine stand out against identikit rivals, and it's topped off by a smart HP logo in the centre. The good looks continue when the lid is eased open. The interior is black and glossy, with subtle silver dots lined all over the wrist-rest, and it's paired by simple glossy bezel around the 15.6in screen. The base is ringed by a metal-effect border that tapers to a narrow front edge, it's a neat visual trick – it makes the HP look slimmer as it hides the black plastic beneath, and it's reminiscent of many more expensive Ultrabooks and Apple notebooks. The good looks are balanced with reasonable build quality. The wrist-rest is extremely sturdy, and the underside is just as strong. There's a little give in the keyboard, but it's not enough to disrupt typing. The screen is the only area where there's any real weakness; its sides are sturdy thanks to a pair of hefty hinges, but the middle of the panel is noticeably weaker. This machine is 23mm thick and weighs 2.3kg – heavier than Ultrabooks, sure, but perfectly manageable. The trackpad is sunken into the wrist-rest, and it's coated with a rough, dimpled pattern. It's a strange feeling since many rivals have smooth pads but it works well, indicating where the pad begins and adding some welcome grip to the surface. The two buttons aren't as good: they're hinged at the bottom, and so they're easier to press at the top, but tricky further down. It's an irritating bit of design. The keyboard is wide enough to include a number pad, and while the rest of the layout is fine, but the action is disappointing. The Scabble-tile keys have little travel, and the actions feel cheap and wobbly. There's just no consistency or comfort, and we wouldn't want to use the HP for prolonged work. The Touchsmart is all about clean corners and gentle lines, with no sharp angles, and it clasps together to make a great-looking laptop. It's certainly better than a bevy of recent rivals: the Toshiba Satellite C50 was dark and bland, Lenovo's G500 series is similarly uninspiring, and HP's own Pavilion 15 ruined its decent looks with terrible build quality – not something we can say about this particular Pavilion, which isn't perfect but still manages to feel much stronger. 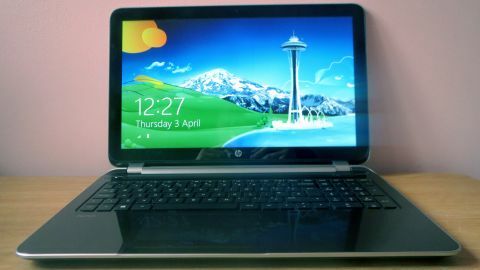 In fact, the only affordable laptop we've seen recently to rival this machine for looks was Toshiba's Satellite M50, which mimicked Ultrabooks with a slim, metal-effect design – but it's also around £100 more expensive than this HP. The £400 budget bites elsewhere, though, and it means that this system hasn't got the best specification. The interior revolves around AMD's A4-5000, which is a mobile part from the firm's Kabini mobile range. It's one of the more powerful chips from this series, but its specification doesn't suggest it'll be a speed demon: four cores that run at 1.5GHz with no extra boost, just 2MB of cache, and a Radeon HD 8330 graphics core clocked to a middling 497MHz. Elsewhere, there are no surprises: 4GB of memory, a bigger-than-average 1TB hard disk, 802.11n Wi-Fi and Gigabit Ethernet, with a DVD driver and an SD card reader. The port selection isn't exactly a selling point, either – there are two USB 3 ports, a single USB 2 socket, an HDMI output and one audio jack. That's not much memory – even cheaper laptops tend to include 8GB these days – but the underside has a removable panel that grants access to one free memory slot, so it's easy enough to add more. This plastic panel also exposes the wireless chip but, unusually, there's no hard disk access.